Createspace Independent Publishing Platform, 9781493616091, 200pp. The rousing memoir Monsters' Throwdown is a collection of moments in the life of the author told in a no-nonsense, brilliantly humorous style. This unflinching look at East Cleveland, Ohio, during the pre- to post-Civil Rights era is an eye-opening illustration of life blooming in even the darkest corners. As Eleanor Lois Tomczyk tells the story of her life, her great sense of humor makes some of the most difficult times in her days growing up in the ghetto easier for anyone to fathom. This is not just a peek, but an all-embracing celebration of a life won by the self-belief and dedication of one woman who was feisty enough to toss the B.S. sandwich she was handed at birth in favor of something more worthy of her wit, intelligence, and dignity. The author's voice is authentic, engaging, and unstoppable. Tomczyk's history is shared so openly, readers will surely feel a familiarity and connection with the heroine-and they will most certainly feel a deep admiration for her. The pluck and stick-to-itiveness of a girl with so many things stacked against her is guaranteed to be inspiration for every reader lucky enough to pick up this book. Eleanor Lois Tomczyk was born in East Cleveland, Ohio. The year was 1948, before civil and women's rights. Her story begins with a self-proclaimed "ignoble" birth of dubious parentage, and her life was a challenge from the get-go. But it was precisely this challenge that shaped her into the unsinkable, witty, bright spirit that she is today. Tomczyk left that life in the ghetto and made one of her own choosing. She has crafted herself into a successful career woman, working in brand marketing as a Sr. EA and event planner for a top Fortune 500 company. She has also been a teacher, an actress, a singer, and an award-winning voiceover artist. 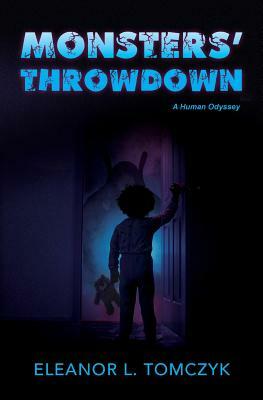 Her popular humor blog has led her to pen the book "Monsters' Throwdown," in which she shares the details of her remarkable life.